These guys again! (Sergio will return soon, we promise!) Have some Jet, Quinton, creepy doctor guy, and someone yelling off page in the meantime! ALSO!!! 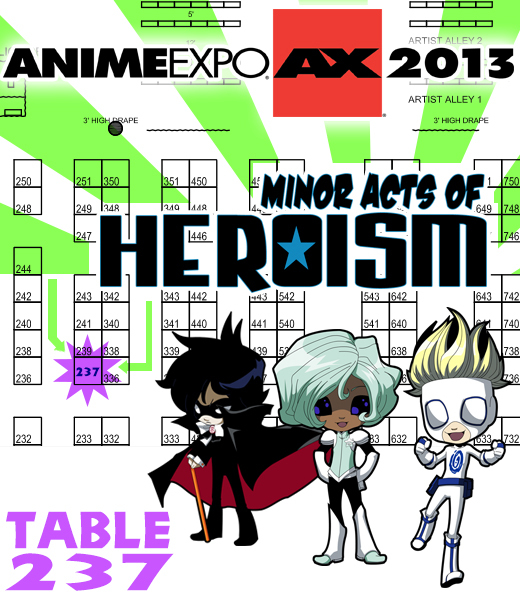 WE'LL BE AT ANIME EXPO JULY 4th-7th!!! Please stop by and say hi if you're there!!! We'll be with the amazing Two Keys comic! Can't wait to see you all there!!! Much love forever always to everyone who can't make it too! Everywhere Kid probably glows all the time because his power is innate/inherited from his father. His father probably only glows when using his power. Ah sad to say i'd probably be the creepy person who does the research on superheroes. On another note Quinton! Dr. Bradley is Simon's step-dad, not dad - so if Simon got it from his "dad," then who did Bradley get it from? Oooh, did he get it from Everywhere Kid? Quinton looks... upset... Bored, maybe? Anyway, creepy deluxe. And Jet's so cute. Really, you went easy on Nilus? Suuuuure! Jet is rather full of himself.......V^-^..........So, does Simon glowing all the time mean something about his power? Ooooooh snap! Don't let him diss a girl being weaker just cuz she a girl! hahaha. But his fashion sense? Awesome! OMG this comic is so genius! I cant stop reading it!! !